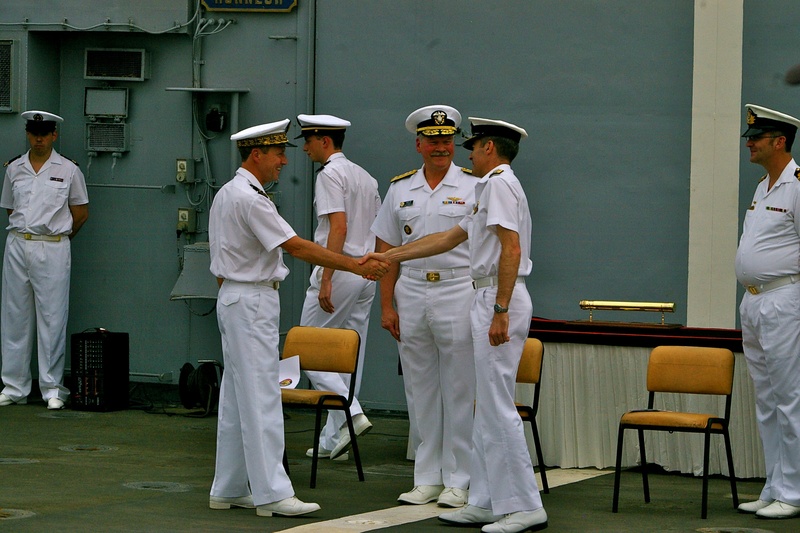 ﻿﻿French Navy Rear Adm. Jean-Louis Kerignard relieved Australian Navy Commodore Greg Sammut as Commander, Combined Task Force (CTF) 150 during a change of command ceremony on board FS Somme (A 631), held in the Mina Salman port facility, Bahrain Apr. 4. 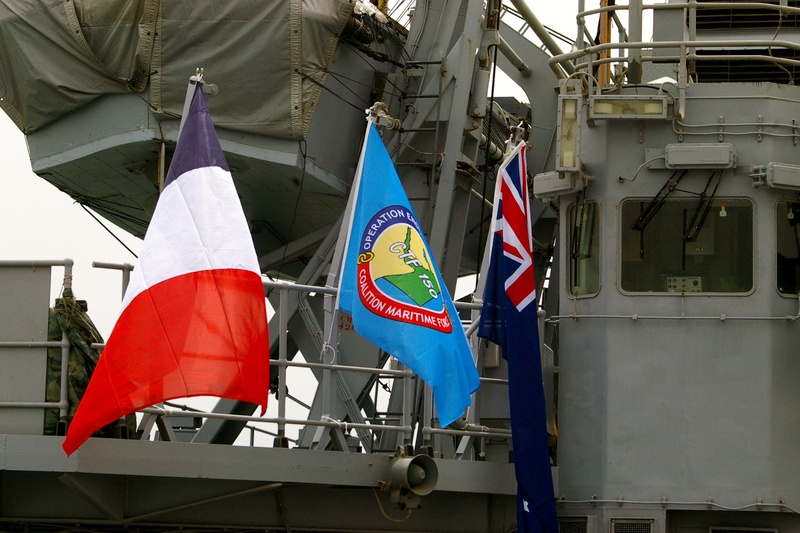 The ceremony concluded the Australian Navy’s second successful command of CTF 150, a multi-national task force that conducts Maritime Security Operations (MSO) in the Gulf of Aden, Gulf of Oman, Arabian Sea, Red Sea and the Indian Ocean. Guest speaker Vice Adm. Mark Fox, Commander, Combined Maritime Forces, praised the effectiveness of CTF 150 as well as the accomplishments of Sammut and his staff. Fox also said he looks forward to working with Kerignard in the Coalition. As well as his flagship, FS Somme, Rear Adm. Kerignard has the US Navy’s Carter Hall (LSD 50), the Pakistan Navy’s PNS Badr (F184), and the Royal Navy’s replenishment ship, RFA Diligence (A 132), under his tactical command. The ships will work together and with other contributors to detect and deter terrorist activities and promote safe operations by legitimate mariners in the region’s waterways. 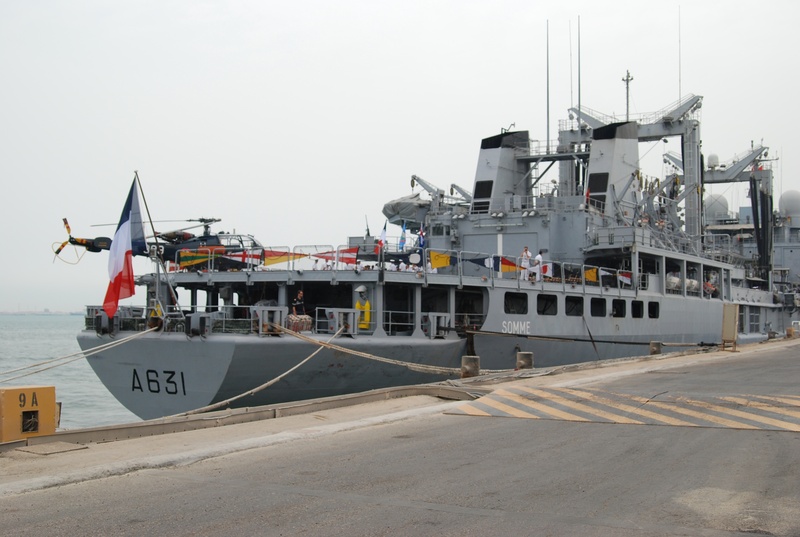 CTF150 exists to create a lawful and stable maritime environment free from terrorism, smuggling and other illegal activities across an area of two million square miles, covering the Red Sea, Gulf of Aden, Arabian Sea, Indian Ocean and Gulf of Oman. CTF150 is a multinational task force. Participatory nations have included: Australia, Canada, Denmark, France, Germany, Italy, Republic of Korea, Netherlands, New Zealand, Pakistan, Portugal, Singapore, Spain, and Turkey, the United Kingdom and the U.S. Combined Maritime Forces (CMF) is a multi-national naval partnership, which exists to promote security, stability and prosperity across approximately 2.5 million square miles of international waters in the Middle East, which encompass some of the world’s most important shipping lanes. Next Next post: Members of CMF conduct Vessels Boarding Search and Seizure (VBSS) training.